Christmas Eve is only a week away. Can you believe it?! Each year, my Mom, Sister and I have a baking day to really get into the Christmas spirit and this year did not disappoint. We made a total of five cookies and these Almond Shortbread cookies were one of them. They are sweetened with maple syrup, but dipping them in chocolate really puts the flavor over the top! 2. In a medium to large bowl, whisk together the maple syrup, coconut butter and almond extract. 3. Stir in the almond flour, coconut flour and salt until a ball of dough forms. *I found it easier to use my hands towards the end to make it into a ball. 4. Roll out the dough on a flat surface until it is about 1/4" thick. Using a circle cookie cutter, cut out 12 cookies and then place them on the parchment lined baking sheet. 5. Bake in the oven for 10 minutes and then let cool. 6. 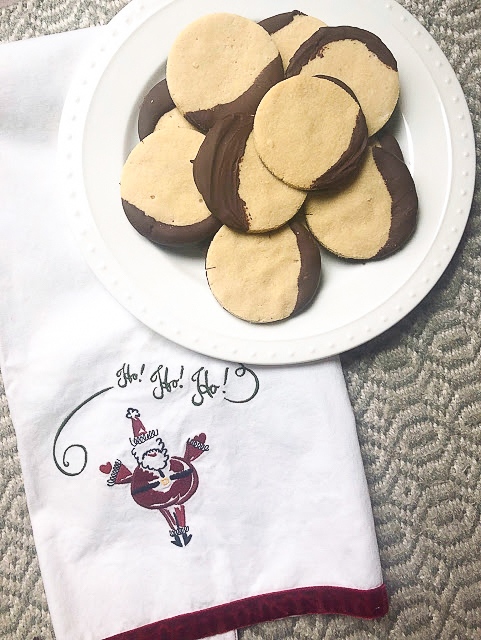 Once completely cool and chocolate is melted, dip the side of the cookie into the chocolate and then dip the entire bottom of the cookie into the chocolate. Place back on the parchment lined baking sheet. 7. Repeat until all cookies are dipped and then place in the freezer for 10 minutes. Remove from the freezer and let the cookies sit out 5 or so minutes before eating. Enjoy!